ARCA Space Corporation (Romanian Cosmonautics and Aeronautics Association : Asociația Română pentru Cosmonautică și Aeronautică - ARCA is an aerospace company based in Las Cruces, New Mexico, United States, that builds space rockets and other manned and unmanned aircraft intended for space exploration. It was founded in 1999 as a non-governmental organization in Romania by the Romanian engineer Dumitru Popescu and other rocket and aeronautics enthusiasts. Since then ARCA has launched two stratospheric rockets, four large scale stratospheric balloons including a cluster balloon and was awarded two governmental contracts with the Romanian government and one contract with the European Space Agency. ARCA Aerospace is currently developing a single stage to orbit rocket designed to be cost-effective rather than re-usable. ARCA was established as Romanian Cosmonautics and Aeronautics Association (Asociația Română pentru Cosmonautică și Aeronautică), a non-governmental organization in 1999 by a group of rocket and aeronautics enthusiasts. Their goal was to construct and launch space rockets. After experimenting with designs for different fuels and rocket engine types, including solid fuel rockets, they decided to use fiberglass for engine and tank construction and hydrogen peroxide as fuel. Their first vehicle was named Demonstrator and was a 10 meter long, unguided, self-stabilized rocket. It never flew, instead it was used in various public exhibitions to attract funds and sponsorships. Their second rocket, Demonstrator 2, was constructed in 2003. 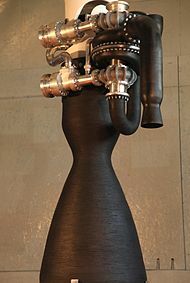 For this, ARCA created their first rocket engine testing installation where they tested their hydrogen peroxide engine. After the tests were successful, they constructed Demonstrator 2B which was an improved version of their previous rocket. It had a 4.5 m length and 0.77 m diameter and used an 18 m high launch pad. In 2003 ARCA also signed up for the Ansari X Prize international competition and started design for the Orizont suborbital vehicle capable of carrying a crew of two up to an altitude of 100 km. Orizont was to be ARCA's competing vehicle for the Ansari X Prize. 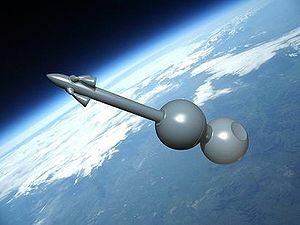 It was designed to use a disposable jet engine up to an altitude of 15 km and then ignite its main hydrogen peroxide rocket engine in order to propel it to the 100 km altitude. On September 9, 2004 ARCA successfully launched the Demonstrator 2B rocket from Cape Midia Air Force Base. Because of powerful wind gusts up to 60 km/h, they were forced to use only 20 percent of the intended fuel quantity in order to keep with the allocated safety zone by the Air Force. The altitude reached was 1200 m. At the launch 90 journalists participated, from Romania, Germany and Austria. After the launch, ARCA started construction of the Orizont spaceplane and completed the aircraft structure by 2005. ARCA organized a public presentation of their Orizont spaceplane in front of the Palace of the Parliament in Bucharest. Because of financial problems encountered with the construction of Orizont, ARCA decided to suspend its development and instead design a new, much smaller rocket called Stabilo. It was designed to be launched from a stratospheric solar balloon and carry one person into space. Design and construction of large scale polyethylene balloons started and on December 2, 2006 at Onesti, Bacau, the crew capsule of Stabilo rocket was lifted to an altitude of 14,700 m. The capsule was safely recovered that evening. The event was transmitted live on several Romanian TV stations. On 27 September 2007 the entire Stabilo rocket (crew capsule + rocket booster) was lifted to an altitude of 12,000 m using the largest solar balloon constructed until that date. The mission was launched from Cape Midia Air Force Base, and the rocket was recovered from the Black Sea surface by Romanian Navy divers. At this moment ARCA proved its ability to conduct large scale operations and to coordinate military institutions like the Romanian Navy and the Romanian Air Force. In 2007 ARCA won two governmental contracts with the Research Ministry for a suborbital rocket and a solar balloon. The Romanian Space Agency, the University of Bucharest and other Romanian institutions were subcontractors to ARCA for these projects. In early 2008 ARCA joined the Google Lunar X Prize competition and designed the Haas orbital launcher. Their lunar rover was named European Lunar Lander and used a monopropellant rocket engine for landing and hovering. Haas was a three-stage orbital rocket powered by hybrid engines using a bitumen-based fuel and hydrogen peroxide as oxidizer. It was supposed to be launched from 18,000 m carried by the largest solar balloon ever constructed, having a volume of 2 million cubic meters. For the Haas rocket, they created a three-stage much smaller demonstrator called Helen that was intended to test technologies and operation. The Helen rocket was intentionally not aerodynamically stabilized, being intended to use a technique based on the pendulum rocket fallacy. The Romanian bank BRD – Groupe Société Générale awarded ARCA a 300,000 euro sponsorship for their activities. Romanian cosmonaut Dumitru Prunariu highly praised ARCA's achievements and noted their ability to efficiently utilize private funds. In 2009 ARCA performed a series of engine tests using the Stabilo rocket engine in order to validate the design for the Helen rocket. The first attempt to launch the Helen rocket took place on November 14, 2009. Romanian Naval Forces participated with the NSSL 281 Constanta ship, the Venus divers ship, the Fulgerul fast boat and two other fast craft boats. For this mission, ARCA constructed a massive 150,000 cubic meter solar balloon, approximately five times as large as their previous balloon. After the balloon began inflating, the mission crew discovered that the balloon inflation arms were wrapped around the lower part of the balloon. Inflation was halted and the crew attempted to unwrap the arms. Three hours later the arms were repositioned and inflation was ready to resume but the sun was already nearing the horizon, and heating the solar balloon was no longer possible. The decision was made to cancel the mission. ARCA decided to redesign the Helen rocket to use two stages and a helium balloon instead. They named the rocket Helen 2. On April 27, 2010 they performed an avionics test for the European Lunar Lander payload to be lifted by the Helen 2 rocket, using a hot air balloon that lifted three ARCA members to 5,200 m altitude. On August 4, 2010 a new attempt to launch the rocket was made, but a construction error in the helium balloon caused it to rupture and the mission was aborted. A new helium balloon was manufactured designed to carry only the second stage of Helen 2 rocket. On October 1, 2010 the rocket performed a successful flight to an altitude of 38,700 m reaching a maximum velocity of 2320 km/h. Upon atmospheric reentry the rocket capsule parachute failed to deploy and the capsule was lost at sea, but the data was transmitted to the mission control center on the 281 Constanta ship and to the Romanian Air Traffic Services Administration. After the difficulties encountered with the stratospheric balloons, ARCA decided to change their approach to orbital launch for the Google Lunar X Prize. They designed a supersonic rocket plane powered by a liquid-fueled rocket engine using kerosene as fuel and liquid oxygen as oxidizer. The aircraft, initially named E-111, was renamed IAR-111 after ARCA received permission from IAR S.A. Brasov to use the traditional IAR designation for military and civilian aircraft constructed since 1925. The aircraft was intended to fly to an altitude of 17.000 m and launch a heavily modified version of the Haas rocket, named Haas 2. Haas 2 was an air-launched three stage orbital rocket intended to place a 200 kg payload into orbit. Work on the plane structure began in late 2010. By 2011 all the fiberglass molds for the aircraft were finished and one third of the aircraft structure was completed. The crew capsule escape system was tested on September 26, 2011 when a Mil Mi-17 helicopter belonging to the Special Aviation Unit dropped the capsule from an altitude of 700 m over the Black Sea. The emergency parachute deployed successfully and the capsule was recovered from the sea surface by the Romanian Coast Guard. In 2012 ARCA decided to focus on the construction of the rocket engine of the IAR-111 aircraft. The engine, named Executor, is made of composite materials, has a thrust of 24 tons force (52,000 lbf) and is turbopump fueled. It uses ablative cooling for the main chamber and nozzle where the outer layers of the composite material vaporize in contact with the high temperature exhaust mixture and prevent overheating. ARCA also presented a long-term space program, until 2025, that besides IAR-111 envisioned a small scale orbital rocket (Haas 2C), a suborbital manned rocket (Haas 2B) and a medium scale manned orbital rocket (Super Haas). In March 2012, ARCA tested an extremely lightweight composite materials kerosene tank that is intended to be used for the Haas 2C rocket. After criticism from the Romanian Space Agency (ROSA) intensified in printed media and television, ARCA decided to send a public letter to the Romanian Prime Minister to intervene in this matter. ARCA mentioned that the Romanian Space Agency is in no position to criticize after the failure of their cubesat Goliat recently launched with a Vega rocket. Furthermore, ARCA was privately funded compared with ROSA that uses public funding. In June 2012 ARCA presented their Haas 2C rocket in Victoria Square in Bucharest, in front of the Romanian Government palace. The same year ARCA won a $1,200,000 contract with the European Space Agency to participate in the ExoMars program. Named the High Altitude Drop Test, the contract consisted of a series of stratospheric balloon drop tests to verify the structural integrity of the EDM parachutes used in Martian atmospheric deceleration. On September 16, 2013 ARCA performed the first successful flight in the ExoMars program, lifting three pressurised avionics containers over the Black Sea to an altitude of 24,400 m. In November, the concrete test stand for the Executor engine was completed. On February 10 ARCA presented a high altitude unmanned aerial vehicle, named AirStrato, that was meant to replace stratopsheric balloon usage for equipment testing and other near space missions. It was intended to be solar powered for extended endurance, was 7 m in length and had a 16 m wingspan with a takeoff weight of 230 kg. The aircraft first flew on February 28. ARCA announced that if the development was successful they would consider developing a commercial version available for sale to customers. On October 17, 2014, ARCA announced that it had transferred its headquarters to the United States to Las Cruces, New Mexico. In a press release they announced that in Romania activities related to software and rocket engine development will continue. They also announced that Air Strato UAV would be available for purchase to customers and that Las Cruces will also serve as a production center for the aircraft. On November 25 they released a website for the UAV revealing two models available for purchase, AirStrato Explorer that could reach altitudes up to 18,000 m with 20 hours endurance and AirStrato Pioneer that would be limited to 8000 m and 12 hours endurance. On July 13, 2015 ARCA announced the beginning of activities in New Mexico, including production and flight tests of AirStrato UAS and Haas rockets, investing US$1.2 million. Popescu faced 13 counts of fraud, five counts of embezzlement, and one count of forgery, according to an online arrest report. Popescu was arrested in Jonesboro, Georgia on Nov. 8 and then extradited to Dona Ana County, New Mexico. He was released on bail on November 28, 2017 and was awaiting trial. In mid-May 2018, criminal charges were dismissed by a grand jury, after 14 hours of testimony and questioning. According to Popescu, it is not yet clear whether ARCA will remain in the USA or New Mexico. The Haas rocket family is a series of rockets of various sizes and configurations intended to replace the initial Haas balloon launched rocket. After the difficulties encountered with balloon operation in Mission 3 and Mission 4, ARCA decided to redesign the rocket to be ground launched. Although heavier and more expensive, ground launched rockets are more reliable, easier to operate and can carry heavier payloads into orbit. Haas 2B is a single stage suborbital rocket intended for space tourism. It can transport a crew capsule and service module into suborbital flight. The crew capsule and service module are the same used for the larger multi-stage Super Haas orbital rocket. At the NASA DC-X conference in Alamogordo, New Mexico in August 2013 ARCA presented an updated version of the Haas 2B rocket with a capsule capable of carrying a crew of five into space. There were discussions with Spaceport America representatives to operate the Haas 2B rocket from New Mexico. Haas 2C is an orbital rocket intended for commercial payload launches. There are two planned variants of the rocket, a single stage to orbit variant capable of placing a 50 kg payload into orbit and a two-stage variant capable of lifting a 400 kg payload into orbit. After testing the extremely lightweight composite tank, ARCA designed a single stage 18m long rocket with a total weight of 510 kg, having a thrust-to-weight ratio of 26:1 and a 50 kg payload. The company displayed the rocket in Victoria Square in Bucharest, in front of the Romanian Government building. The second stage version will be powered by the Executor engine for the lower stage, and the upper stage will use a smaller engine adapted for vacuum, named Venator. Haas 2CA is a rocket designed to be able to launch 100 kg into a low-Earth orbit, at a price of US$1 million per launch. The first flight is intended to launch from Wallops Flight Facility in 2018. The rocket is designed as a Single-stage-to-orbit (SSTO) and features an Aerospike engine, producing 50,500 pounds-force (225 kN) of thrust at sea-level and 73,800 pounds-force (328 kN) of thrust in vacuum. IAR-111(English : Romanian Aeronautical Industry Brașov ; in Romanian Industria Aeronautica Romana Brașov, former Industria de Avioane Romaneasca ) is a sea-launched suborbital rocket plane. It uses the same Executor engine as Haas 2B and 2C rockets. It has a length of 24 m, a wingspan of 12 m and a take-off weight of 19 tons. It can carry a crew of two, a pilot and passenger. The flight sequence consists of take-off from sea surface, horizontal flight at subsonic speed, followed by a rapid climb to an altitude of 16,000 m in approximately two minutes. As a space tourism development platform, it can reach 2.6 Mach at 30,000 m. After fuel depletion, IAR-111 will descend in gliding flight and land on the sea surface. In case of emergency, the crew capsule is detachable and equipped with two rocket-propelled parachutes. The IAR-111 capsule was flight tested during Mission 6. The mission took place in cooperation with the Special Aviation Unit and the Coast Guard, belonging to the Ministry of Internal Affairs and Administration. AirStrato is an electric powered medium-sized unmanned aerial vehicle that was being developed by ARCA. There were two variants planned, the AirStrato Explorer with a target flight ceiling of 18,000 m and AirStrato Pioneer with a target flight ceiling of 8000 m. It was supposed to carry a 45 kg payload consisting of surveillance equipment, scientific instruments, or additional battery pods for extended autonomy. The first prototype's maiden flight took place on February 28, 2014. It was equipped with fixed landing gear. Two more prototypes were constructed that lacked landing gear. Instead, ARCA opted for a pneumatic catapult as a launcher and landing skids and a recovery parachute for landing. Both prototypes only performed take-off and landing testing and short low altitude flights. ARCA has constructed a drop test vehicle for the European Space Agency intended to test the atmospheric deceleration parachutes for the ExoMars EDM lander module. It has the same weight and parachute deployment systems present on the ESA module. The DTV is intended to be lifted to an altitude of 24 km by a stratospheric helium balloon. From that height, it will fall freely reaching a dynamic pressure similar to that encountered by the ExoMars EDM at entry into the Mars atmosphere. At that dynamic pressure the parachute will deploy and the module will land on the Black Sea surface and will be recovered by the Romanian Naval Forces. The Executor is a liquid-fueled rocket engine intended to power the IAR-111 Excelsior supersonic plane and Haas 2B and 2C rockets. Executor is an open cycle gas generator rocket engine, that uses liquid oxygen and kerosene and has a maximum thrust of 24 tons force. ARCA decided to use composite materials and aluminum alloys on a large scale. The composite materials offer low construction costs and reduced weight of the components. They were used in the construction of the combustion chamber and the nozzle, and also the gas generator and some elements in the turbopumps. The combustion chamber and the nozzle are built from two layers. The internal layer is made of silica fiber and phenolic resin, and the external one is made of carbon fiber and epoxy resin. The phenolic resin reinforced with silica fiber pyrolyzes endothermally in the combustion chamber walls, releasing gases like oxygen and hydrogen, leaving a local carbon matrix. The gases spread through the carbon matrix and reach the internal surface of the wall where they meet the hot combustion gases and act as a cooling agent. Furthermore, the engine is equipped with a cooling system that injects on the internal walls 10 percent of the total kerosene mass. The pump volutes are made of 6062 type aluminum alloy. The pump rotors are made through lathing and milling using 304 type steel. The supersonic turbine is made of refractory steel, both the core and the blades. The turbine rotation speed is 20.000 rpm and has a 1,5 MW power. The intake gas temperature is 620 degrees Celsius. The main engine valves are made of 6060 type aluminum and are pneumatically powered, without adjustment. The engine injector and the liquid oxygen intake pipes are made of 304 L type steel and the kerosene intake pipe is made of composite materials. The engine has the possibility to shift the thrust by 5 degrees on two axes. The articulated system is made of composite materials and high-grade steel alloy. The engine is rotated using two hydraulic pistons that use kerosene from the pump exhaust system. ARCA announced that the Executor engine has a thrust/mass ratio of 110. Venator is a liquid-fueled pressure-fed rocket engine that will be used to power the second stage of the Haas 2C rocket. It burns liquid oxygen and kerosene and has a maximum thrust of 2.5 tons of force. The engine has no valves on the main pipes. Instead, it uses burst disks on the main pipes, between the tanks and the engine. The second stage is pressurized at 2 atm at lift-off and after the first stage burn-out, the second stage will be pressurized at 16 atm. At that pressure the disks will burst and the fuel will flow through the engine. Mission 1 took place on December 2, 2006, when a solar balloon carried the STABILO system capsule to an altitude of 14,700 m. The altitude was slightly lower than intended because of extreme turbulence encountered during the last stage of the flight. In light of this, it was decided not to risk damaging the system. The flight had been planned since August 2006, when another large solar balloon was launched at low altitude in controlled flight. During this time a specially designed parachute was tested. It was the first stratospheric flight performed by ARCA, and the event was transmitted live; over 20 journalists were present. Mission 2 of STABILO 1B was launched on 27 September 2007 from Cape Midia Air Force Base. The Romanian Air Force participated with two radar stations. Civil Aviation and the Romanian Navy also participated, the latter with one naval diver's ship. The first and second vehicle stages reached an altitude of 12.000 m. After one hour and 30 minutes and having traveled 30 km from the launch location, STABILO landed on the sea surface and was intercepted by a Navy Saturn ship and recovered by divers. The recovery ship was guided by the satellite transmission system and by Air Force radar. The vehicle was transported to the Navy shipyard. The electronic equipment continued to transmit to the command center even 8 hours after the flight had ended. Helen was a demonstrator rocket for the Haas balloon launched orbital rocket. It was intended to test in flight the avionics and gravitational stabilization method proposed for the much larger Haas rocket. Helen was intended to reach an altitude of 80 km. Two versions were created, a three-stage rocket that had cylindrical tanks and used hydrogen peroxide as monopropellant fuel, and a two-stage spherical tank rocket that used the same propulsion type. The rocket used a physically flawed stabilization technique based on the pendulum rocket fallacy. Mission 3 took place on November 14, 2009 on the Black Sea. Romanian Naval Forces participated at the mission with one logistical ship, one diver's ship and another fast craft. For this mission, ARCA constructed the largest stratospheric helium balloon to date. An error in construction caused the balloon's inflation arms to wrap around the base of the balloon when it was inflated. The team managed to unwrap the arms and to resume inflation but sunset was approaching and the solar balloon could no longer be used. The mission was cancelled. For Mission 4 ARCA decided to use a helium balloon instead and to redesign the Helen rocket. The new version, named Helen 2, was prepared for flight on August 4, 2010. When balloon inflation was initiated, the balloon ruptured because of a construction error and the mission was cancelled. A new attempt was made on October 1, 2010 by using only the final stage of the Helen 2 rocket and a smaller helium balloon. The flight, named Mission 4B, was successful, Helen 2 launching at an altitude of 14,000 m and the rocket reaching an altitude of 38.7 km. After the difficulties encountered with stratospheric balloons, ARCA decided to stop work on the Haas rocket and design a new family of ground-launched orbital and suborbital rockets. Mission 5 was carried out in partnership with the Romanian Air Club and the Romanian Aeronautic Federation. It took place before the Helen 2 rocket launch. The flight took place on April 27, 2010 between 07:45 and 08:45 AM, taking off from Hogiz, Brasov. A manned hot air balloon lifted the Helen 2 rocket pressurised capsule to an altitude of 5200 m. The maximum distance between the carrier balloon and the command center at Sanpetru airfield was 42 km, which corresponded with the Helen 2 rocket simulated safety zone. The balloon crew was composed of Mihai Ilie – pilot, Mugurel Ionescu – copilot, and Dumitru Popescu – ELL equipment operator. The objective of the flight was to test telemetry, command and live TV transmission for the Helen 2 rocket. Mission 6 tested the recovery system for the IAR-111 supersonic plane crew capsule. On September 26, 2011 a Mi-17 helicopter from Special Aviation Unit lifted the capsule to 700 m above sea level. At that altitude, the helicopter released the capsule. The parachute deployed, and the capsule landed on the sea surface. It was recovered by the same helicopter with the help of the Romanian Coast Guard. WP3 was a validation test flight for the ExoMars Program High Altitude Drop Test (HADT), carried out in cooperation with the European Space Agency. The launch took place from the Black Sea coast on September 16, 2013 and the hardware comprised three pressurized containers containing the avionics equipment that will be necessary to test the ExoMars spacecraft parachute during future incoming flights. The pressurized containers, carried by a cluster balloon, were launched at 7:15 AM and the ascension took 90 minutes. When the containers reached an altitude of 24.4 km, they were released under a dedicated recovery parachute and landed on the sea twenty minutes later. The containers and the recovery parachute were recovered by the Navy 92 km from the launch point. The objectives were flight testing the avionics and communication systems, demonstrating the container sealing after sea landing and the capability to identify and recover the equipment from the sea surface. ^ "DEMONSTRATOR 2B – ARCA". www.arcaspace.com. Retrieved 11 August 2017. ^ "STABILO – ARCA". www.arcaspace.com. Retrieved 11 August 2017. ^ a b "Helen – ARCA". www.arcaspace.com. Retrieved 11 August 2017. ^ Cosmic warfare: ARCA responds to the attacks from the Romanian Space Agency, Jurnalul National, retrieved 2014-03-31 . ^ "AirStrato air – robot to start the flight tests in New Mexico" (PDF) (Press release). ARCA Space Corporation. 13 July 2015. Retrieved 20 July 2015. ^ "Criminal charges against ARCA CEO dropped". Las Cruces Sun-News. Retrieved 2018-05-18. ^ "Haas 2B – ARCA". www.arcaspace.com. Retrieved 11 August 2017. ^ "Haas 2CA – ARCA". www.arcaspace.com. Retrieved 11 August 2017. ^ "Haas 2CA". ARCA Space. Retrieved 30 May 2018. ^ "Haas 2CA Specs". ARCA Space. ARCA Space. Retrieved 30 May 2018. ^ "IAR 111 Excelsior – ARCA". www.arcaspace.com. Retrieved 11 August 2017. ^ Romanians are testing an unmanned aerial vehicle with amaizing performances, Jurnalul National . ^ "ARCA va lansa satelitul bulgaresc CubeMessenger" [ARCA CubeMessenger Bulgarian satellite launch] (in Romanian). ARCA. 2012-08-03. Retrieved 2012-08-04. Wikimedia Commons has media related to Asociația Română pentru Cosmonautică și Aeronautică.